Office 365 Resource Manager allows users to display SharePoint lists data as a table with task stripes oriented along the time axis. Virto Office 365 Resource Manager App is created for an effective SharePoint resource management. You can add and edit SharePoint project tasks, check the workload of your employees and utilization of material resources in a chart view! Virto Office 365 Resource Manager is a part of Virto ONE Cloud. 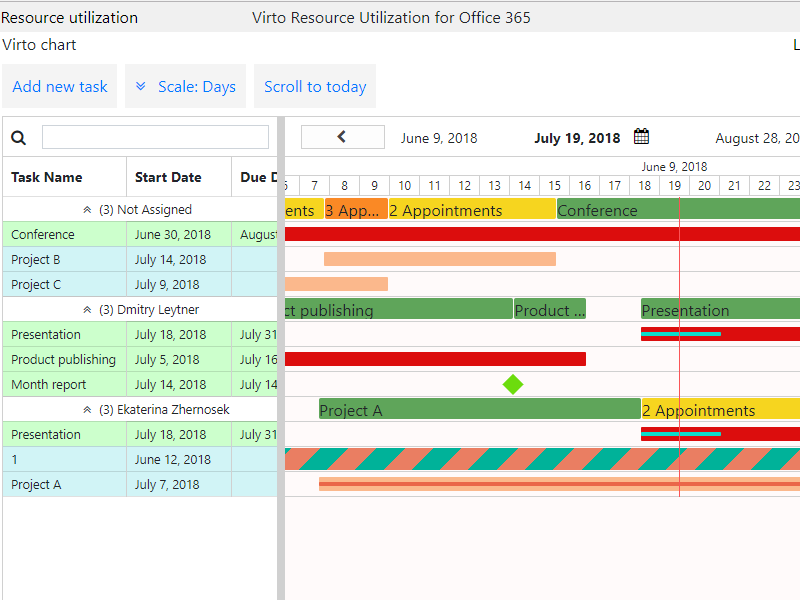 Virto Office 365 Resource Manager app allows you to add one or several resource lists to a chart. You can select list fields to be displayed and available to edit in chart. You may also set user and user groups permissions to edit and read only tasks in a chart. Office 365 Resource Manager app allows users to view and edit data from SharePoint lists of any type. 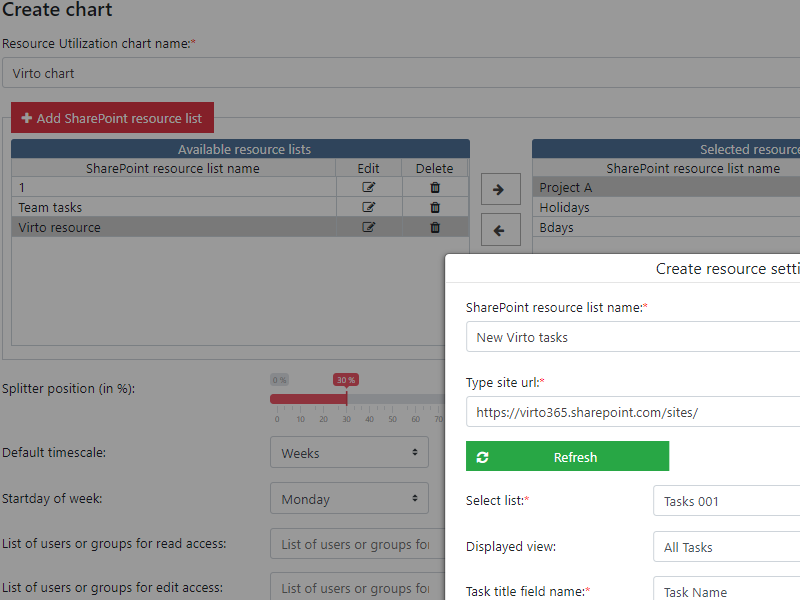 You can display SharePoint online resources (which are customized and color-coded SharePoint lists) in a view of a gantt table. 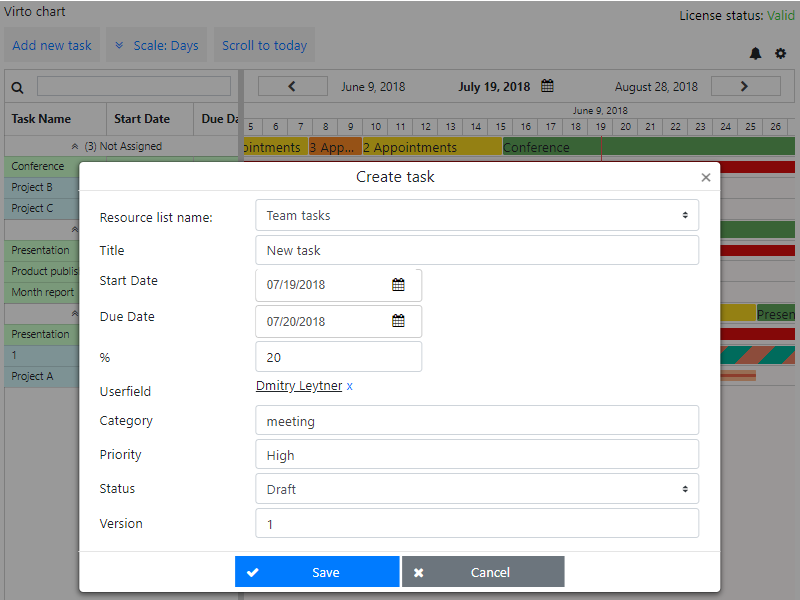 Manage project and material resources, create, edit, and reschedule tasks, and easily check the workload of your employees with Office 365 Resource Manager app. Using Office 365 Resource Manager, you can resize and drag & drop tasks to change their duration or dates. SharePoint resource tracking is convenient for short and long-term projects and tasks, you can quickly switch to different timescales (Hours, Quarter Day, Day, Week, Month, Quarter, Half year). You can create, view, edit, or delete tasks right in the table. And, of course, you can assign colors for tasks, resources and the table strings.